Mozilla is working on a new web browser for Android to replace the currently available Firefox for Android mobile browser. Firefox users who use the browser on Android may have noticed that development slowed down in recent time. Updates are still released regularly but they address issues such as slowdowns, crashes, or security issues for the most part. The core reason for that is that Mozilla's working on Fenix, a new mobile browser for Android. Fenix is based on Android Components and GeckoView. In other words, Fenix will be powered by built-in components on Android and Mozilla's GeckoView. Note: The following is based on mockups and not the final product. Things may change during development. Mockups are useful, however, to get a first impression of a product. The very first thing that Firefox for Android users may notice is that the address bar is shown at the bottom of the interface in the screenshot. 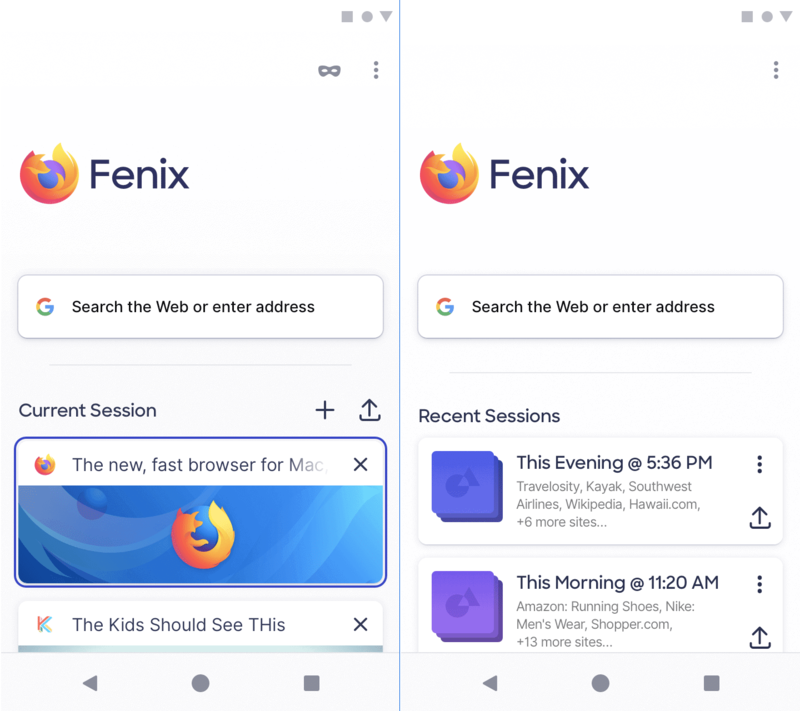 The current version of Firefox for Android displays the address bar and menus at the top; Firefox Rocket / Firefox Lite, another mobile browser for Android by Mozilla, divides the interface. The mobile browser displays the address bar at the top but the menu bar at the bottom of the browser interface. Fenix moves the entire browser chrome to the bottom. Users find the address bar, home button, and menu listed there. The menu displays important options such as back, forward and reload buttons, new tab and private tab creation options, an option to switch to the desktop site, and to open the settings or the library. 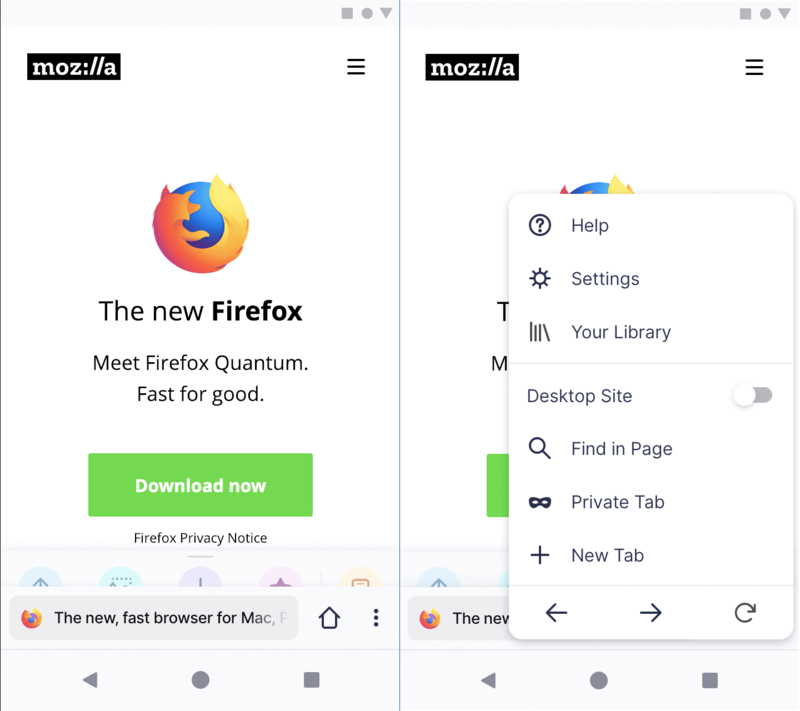 The Library provides access to bookmarks, downloads, the browsing history, and other features on the desktop, and it seems likely that the new Firefox for Android will provide similar functionality. Barely visible in the screenshot is another toolbar on top of the address bar. 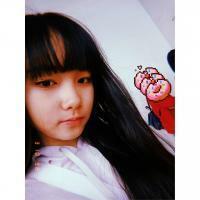 It is a quick actions toolbar to use favorites among other things. The start screen of the new mobile browser displays a unified search and address field, and the current or recent sessions. Current session lists open tabs in the browser while recent session tabs groups of tabs that were open previously in the browser. All tabs open in Fenix at the time of closing are automatically added to a new session that users may access in the future. Mozilla plans to integrate other core features into Fenix such as tracking protection or the ability to display websites offline. Work on Fenix continues and Mozilla has not revealed yet when Fenix will become available and how the organization plans to get Firefox for Android users to migrate to the new browser. Does it still support firefox mobile addons? Good to see them improving it. Looks good too. It's possible, but at the same time not for sure. The reason is, while it seems to be using Firefox's own engine, it's also might be using Android's build-in components too.